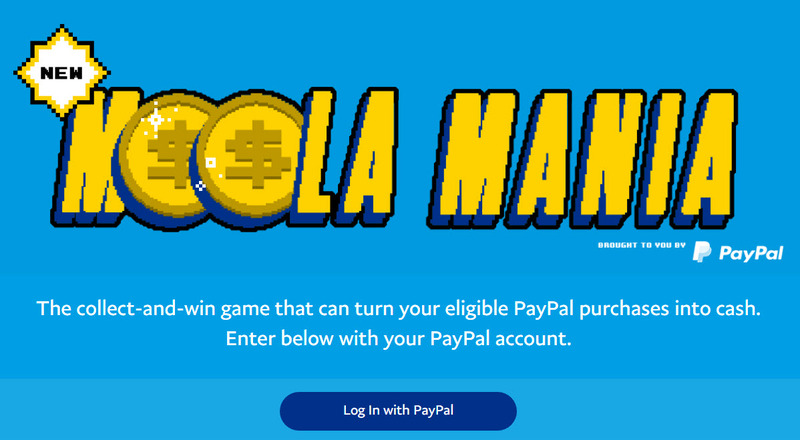 Play the PayPal Moola Mania collect-and-win game that can turn your eligible PayPal purchases into cash. Enter with your PayPal account for your chance to win 1 o f over 10,000 cash prizes! Official Rules: open to US, DC, 18 and older, and valid U.S. PayPal account holders in good standing at the time of registration and through the time of prize award. Begins on February 1 and ends on March 15. You may request up to 10 codes a day that will arrive by email. You may earn up to 10 game plays per day regardless of method used to play (purchase or no purchase). How to Enter: The Promotion consists of an Instant Win Game and a Collect and Win Game. Regardless of method of entry, you will need a PayPal account. If you’d like to participate in this Promotion, but aren’t yet a member, visit paypal.com and follow the links and instructions to sign up for free for a PayPal account. Make a Qualifying PayPal Transaction: Once you’ve registered, make a qualifying PayPal purchase transaction. Qualifying Transactions include purchases made in USD using a valid U.S. PayPal account that have been marked as “Completed” in your PayPal account. (see rules for additional information), Then Click Here to Enter. The Purchase Method Promotion Site will show how many game plays you have available as a result of making a Qualifying Transaction. If game plays are available, you must follow all links and instructions to complete a game play (e.g., by clicking “Play the Game” or similar). For each Qualifying Transaction, you will be eligible to receive one game play. 1. Click Here to request a free code that will be delivered to the email address associated with your PayPal account. 2. Once a Code is obtained, Click Here and follow the links and instructions to enter your Code. Once your Code is validated, you will receive one Instant Win Game play. Each Code may only be entered one time during the Promotion Period. Note: If you have issues using the codes directly on the site, make sure to use the link in the email that comes with the code instead. Collect and Win Game: Each time you play the Instant Win Game during the Promotion Period and do not win, you will receive one Collect and Win Game piece in the form of a virtual token. Each tier of prizing (Grand, First, Second, Third) has three unique Game Pieces that must be collected to win a prize in that tier. You can track your progress by logging in to the applicable Promotion Site and viewing your gameboard. Bonus Code: During the Promotion Period, you will receive one bonus Code, if you collect three duplicate Game Pieces (i.e., you collect a Game Piece that you already have). Limit: There is no limit on the number of Bonus Codes each entrant may receive during the Promotion Period, but each duplicate piece may only be used one time toward earning a Bonus Code. One (1) Collect and Win Grand Prize: $10,000 transferred into your PayPal account. Five (5) Collect and Win Game First Prizes: $1,000 transferred into your PayPal account. Prize Limit: One Collect and Win Game Prize per prize tier and an unlimited amount of Instant Win Game prizes per person. I requested the 10 free codes but 9 of the 10 stated the code had already been used. Are the sending out duplicate codes to everyone? I Won $5.00 and another $5.00 too. I haven’t received a single code although I have requested them daily. Any one else having trouble? My first code request today said it’s already been used. Really? I’m getting my codes fine. I won $5 twice, but no email notification of winning. I emailed helloworld this morning and still waiting for confirmation. I’ve won the $5 twice now and got it not problem, got an email about it almost instantly. No problem using 10 codes a day either…..
I’ve tried to find anything through Paypal that this is legitimate and have found nothing through Paypal. It seems a way for them to get your information. I changed my password and not taking anymore chances. It’s legit, it’s run by helloworld (former Eprize) promotions. That is a major promotions company that runs contests for various companies. Paypal also confirmed it was legit on FB when it first came out. i Won $5.00 twice too.